“Move with the times, or you’ll be left behind,” an advertisement shown in the play “Golem” shouts. Theatre Company 1927’s “Golem,” inspired by Jewish folklore, is an original drama exploring the use of technology and the danger of using it in the wrong way. “Note that the technology itself is not problematic. 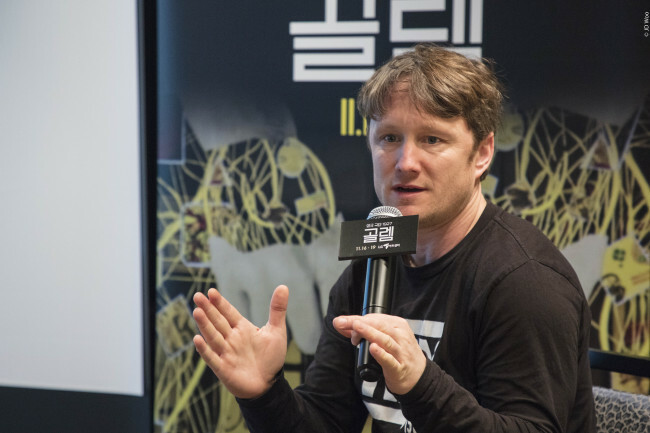 It is the people who control and make technology that is problematic,” said Paul Barritt, the creator of the film, animation and design components of the play, during a press conference held at LG Arts Center in Seoul on Tuesday. The story may look like the latest in the long line of “Frankenstein,” “Blade Runner,” “I-Robot” and other adaptations of the man-abuses-technology dystopian story. But the show does not present technology as evil. “What the show really does is present an argument that things could go this way with technology, if we don’t think about how we use it,” said Barritt. In the show, an ordinary man’s life is irrevocably disrupted when he buys a golem, a type of cutting-edge machinery that is constantly upgraded. As newer versions of golem are presented to the man, it gains greater and greater control over him. The play, written and directed by Suzanne Andrade, shows how humans relinquish control over their lives to technology for the sake of convenience. Sound crazy? Ever let an iPhone app decide which restaurant you should dine in? Ever sought fashion advice from a shopping mall app? Ever let a dating app recommend potential dates? Burritt said that parody and reflection of the world has been the creators’ intent, but with a touch of dark, British humor. The way golem is developed and quickly sold to big businesses is very much like how the earliest programing pioneers like Bill Gates and Steve Jobs turned their innovative inventions into profit-seeking product. “Early programmers like Bill Gates were like hippies. They thought that they were doing would make the world great. ... Which they can still potentially do. But it (their work) has become this huge corporate monster,” he said. The show combines animation with live-acting to create active transition between sets and scenes, something that co-founders of 1927 Burritt and Andrade have worked on. “Usually (in plays), a video designer is brought in at the last minute and the video looks like it’s tagged on. But (with 1927’s works), I’m there from the beginning,” he said. “One of the interesting things is the way we use it. Animation is used in not a filmic, but a theatrical way. ... No close-ups and it doesn’t draw you in like a film does, but it (animation in theater) has elements of theater. It adds sort of dreamy element to theatrical live performance. Burritt said he saw a huge potential for the new hybrid form of theater that traverses the boundary with film. “The future is wide open, as far as I can see,” he said. 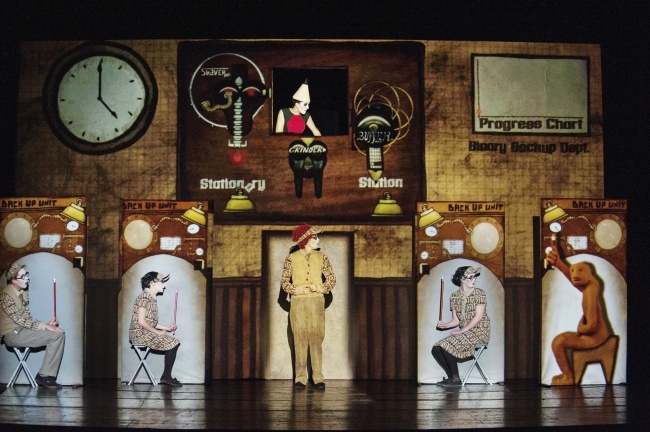 What is ironic is that the creators of “Golem,” a show that talks about how the use of technology can be dangerous, use technology to enhance the theater experience. But as Burritt emphasized, it is the use of technology that can be problematic. “I think the dystopian side to (the story of Golem) is about the way we saw technology and how it started to change the way people behave,” he said. “Golem” will be performed at LG Arts Center from Friday to Sunday. The hours are 8 p.m. for weekdays, 3 p.m. and 7 p.m. for Saturday and 3 p.m. for Sunday. Tickets range from 40,000 won to 80,000 won. For inquiries, visit www.lgart.com or call (02) 2005-0114.